For those of you who love behind the scenes action on the making of a movie, this is for you. 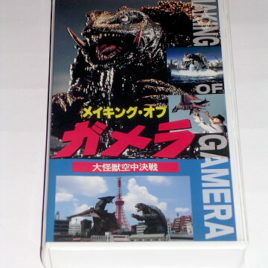 The movie is Gamera Guardian of the Universe 1995 directed by Shusuke Kaneko. The VHS is 50 minutes of exciting special effects and behind the scenes action. It is in Japanese. This is a used vhs in excellent playing condition. 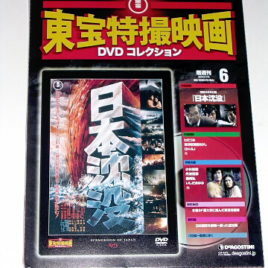 An incredibly priced collector's item DVD and magazine produced by Deagostini Company Japan continues its biweekly series with The Submersion of Japan aka Japan Sinks; aka Tidal Wave which featured Godzilla suit actor Haruo Nakajima in a small non suit role as the prime minister's chauffeur. This original Japanese version contains the entire 140 minute film. The American verion only ran 90 minutes. This movie is HARD to FIND outside of Japan so here is your chance to see Japan's answer to IRWIN ALLEN's Catastrophe movies of the 1970's. There are some AMAZING behind the scenes photos in the magazine. These DVDs are beautiful prints of the complete Japanese Theatrical release of the movie. Deagostini Company will issue 55 of Toho Film's Tokusatsu (Special Effects) movies in an imaginative format with protective case and collector's magazine with many photos, production background, actor biographies and a column by special effects master Kawakita Koichi. The magazine also features a FOLD OUT MINI POSTER! The packaging on vol 6 has easier access to the dvd than some of the earlier volumes and the entire package is covered in cellophane. 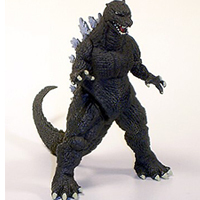 The next in the series will be Godzilla's Counterattack aka Godzilla Raids Again; aka Godzilla vs Angilas 1955. This series is sure to be a huge Collector's Item so get yours now! The DVD requires a region free player. The DVD is in Japanese with no subtitles. Scroll down to view more photos.